In the Nordic region wood has been used as a building material for tens of thousands of years. Anssi Lassila recounts what he has learnt from traditional construction methods and how this has helped him create innovative solutions for the future. The lecture will be followed by a panel discussion under the theme of Country Life on Scene G3. Anders Nyquist – architect, founder and principal Eco Cycle Design, Njurunda, Anssi Lassila – architect, founder and principal OOPEAA (Office for peripheral architecture), Helsinki, Christian Broen – project leader Dansk Byplanlaboratorium, Copenhagen, Hlédis Sveinsdottir – architect, co-founder and principal EON arkitektar, Reykjavík, and Sixten Rahlff – architect, co-founder and principal 3RW arkitekter, Bergen will discuss issues of sustainability related to the relationship between urbanization and the countryside. The Nordic Architecture Fair is a two-day event that brings together architects, town planners, property developers and building contractors to discuss one of today’s most pressing questions: What kind of society do we want in the future, and how will it function? Nordic Architecture Fair is organized by The Swedish Exhibition and Congress Center. It is a dedicated Nordic exhibition, conference and meetings event for cutting edge architecture and urban planning. There are four areas of focus Architecture and Urban planning, Digital building, Innovative materials and Smart buildings. The speakers include Helle Juul, MD, Juul & Frost.,Gert Wingårdh, MD, Wingårdhs Arkitektkontor, Gro Bonesmo, Space Group, Monica von Schmalensee, MD, White Arkitekter, Sima Zangiabadi, Head of Business Development, PEAB, Lars Andrén MD, Momentum, Emma Jonsteg, Charles Renfro and Julien De Smedt. Anssi Lassila of OOPEAA receives the Alfred Kordelin Prize on November 6, 2017. Alfred Kordelin Foundation supports the sciences, literature, the arts and public education with grants and awards. This time, the foundation gave out grants to support the arts and sciences with the total amount of €3.2 million euros. There were 4 760 applications for grants and 271 grants were given out to researchers, artists and societal agents. In addition, four prizes totalling 120 000 euros acknowledging important contribution of individuals in their fields were awarded to a virologist, Finnish translator, an architect and a journalist in recognition of their exceptional work. The recipients of the 2017 Alfred Kordelin Prize are Anssi Lassila, architect, Sarah Butcher, professor of microbiology, Kari Klemelä, Finnish translator, Elina Grundström, journalist and author. In its statement, the board of experts deciding on the nominations for the Alfred Kordelin Prize characterized the work of Anssi Lassila as original and distinctive. They praised his work for a careful consideration of the historical context of the site, an ecological use of materials and a strong sense of materiality of the final building. They noted that his architecture is contemporary in its expression yet also rooted in the tradition of Finnish craftsmanship. The Alfred Kordelin General Progress and Education Fund, established in 1918, is one of the oldest foundations in Finland operating in the Finnish language. Alfred Kordelin’s (1868-1917) idea was that ‘work for Finnish culture must be granted support in order to strengthen and deepen it internally, and also to represent Finnishness amongst other nations.’ The Fund’s first grants were awarded in 1920. Since then, the Foundation has provided uninterrupted support to Finnish science, arts, literature and adult education, and promoted internationalization. This year, 2017, marking 100 years since the death of Alfred Kordelin, a total of 5 million euros will be given out by the Foundation in grants and prizes. For a press release by the Alfred Kordelin Foundation, see here. 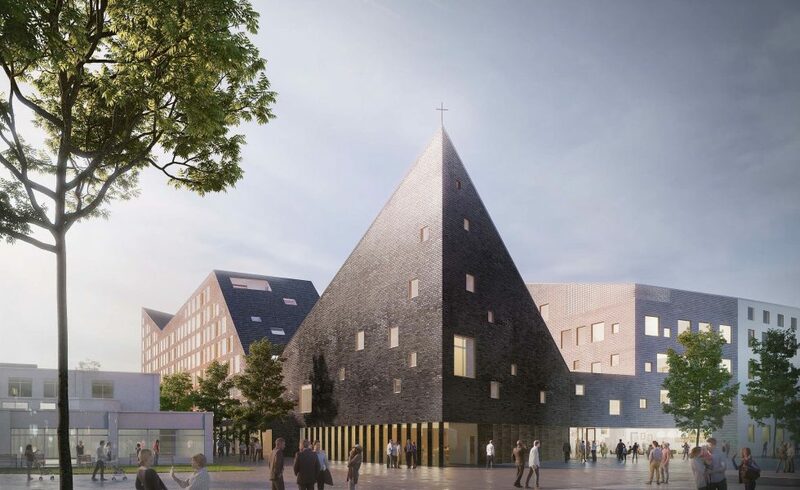 OOPEAA’s proposal, Church in the City was selected as winner in the competition for a new church in Tikkurila. The church will be built by Lujatalo in alliance with OOPEAA through a collaborative design process in which the architect and the builder develop the project together in a close relationship with the client. Also the competition entry was developed in collaboration between the architect and the builder, and the collaborative process was considered as a factor in the competition evaluation. Located in the eastern half of the metropolitan area of Helsinki, Tikkurila is the administrative and commercial hub of Vantaa and it has about 220 000 inhabitants. The goal for the Church in the City project is to create a church building that serves the community in its many needs in multiple ways as well as offers office and meeting spaces for social services and parishioners in Tikkurila. The new church firmly takes its place in a centrally located block in the center of Tikkurila. It is both bold and subtle in its character with the main church hall rising tall and completing the block in a well-balanced dialogue with the surrounding buildings. With a strong presence in the streetscape, it forms an identifying landmark for the neighborhood. In the interiors, the atmosphere is cozy and relaxed and the scale of the building takes the personal experience of people as its starting point. While the building offers work spaces that support contemporary work styles, it also serves as a meeting place for people in their everyday activities as well as for special occasions. The church hall will seat an audience of 500 in its maximum capacity, with the possibility to divide the space in various ways to accommodate multiple simultaneous activities according to need. There will be workspace for up to 143 people in the building with several meeting spaces of various sizes and levels of openness or privacy to accommodate the people of the neighborhood with a café, a yard to serve as a gathering space in the summer months, and a shop area. The church is integrated in a block that will also contain an adjoining apartment building that offers social housing and student housing. The Bethania Housing is included as an option to be built concurrently with the church as the project progresses. It will be composed of 185 units in a total of 11 700 layer square meters. The church is commissioned by the Vantaa Parishes and it is slated to be ready in 2020. The Bethania Housing will be commissioned by the Vantaa Parishes and by HOAS, the Foundation for Student Housing in the Helsinki Region. For a press release on the competition in Finnish, see here. For more information on the New Tikkurila Church, see here. 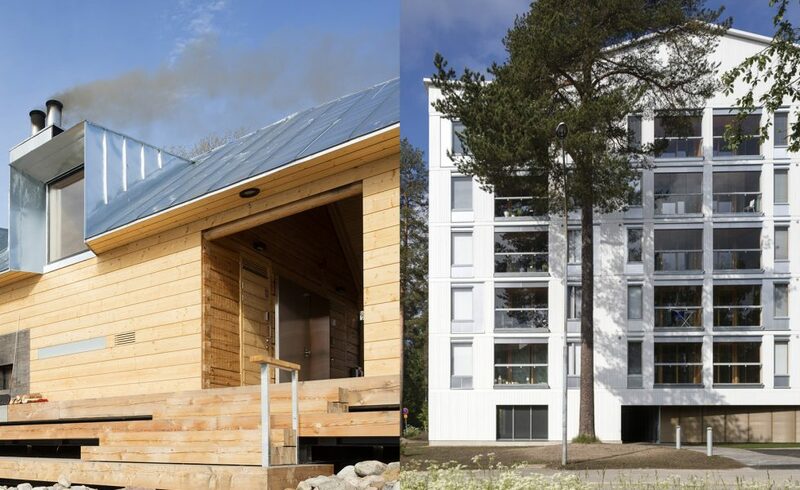 Two projects by OOPEAA, Lonna Sauna and Pihapetäjä Housing have been nominated for the Wood Award / Puupalkinto 2017. The Wood Award is granted annually as a sign of recognition to a building, interior or structure that represents Finnish wood architecture of the highest quality or in which wood has been applied in a way that advances research and development in construction techniques in a significant way. The prize was given out for the first time in 1994 and it is now awarded for the 20th time. The prize is awarded by the Wood Information Center Finland. The award will be announced on Wood Day / Puupäivä on November 30, 2017 in Helsinki. You can find all the nominees and vote for your favorite one here. The Lonna Sauna is a new a public sauna located on the small island of Lonna in the archipelago just in front of the city center of Helsinki. It is part of the historical continuum of the tradition of public saunas in Finland. The building was commissioned by the Governing Body of Suomenlinna and it was officially opened to the public in summer 2017. On the border between urban and nature, between the busy life of the city and the open landscapes on the sea, with views framing the silhouette of the city on one side and opening towards the see on the other, the Lonna Sauna offers people a way to relax and enjoy the nature and the sea. 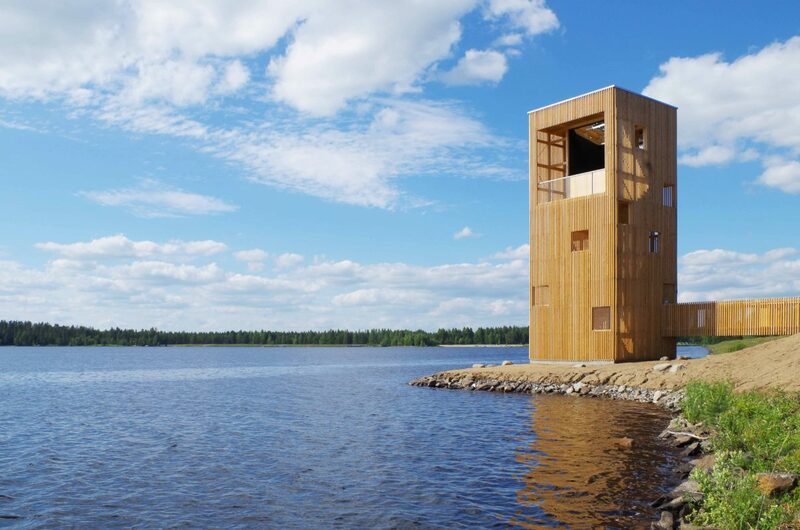 Just a short boat trip away from the city, the Lonna Sauna is part of the unique environment of the island where the man-made meets the natural and enters into dialogue with it. With its wood-burning stove it offers a great bathing experience. It allows the bathers to enjoy the view to the sea while relaxing in the warmth of the sauna. 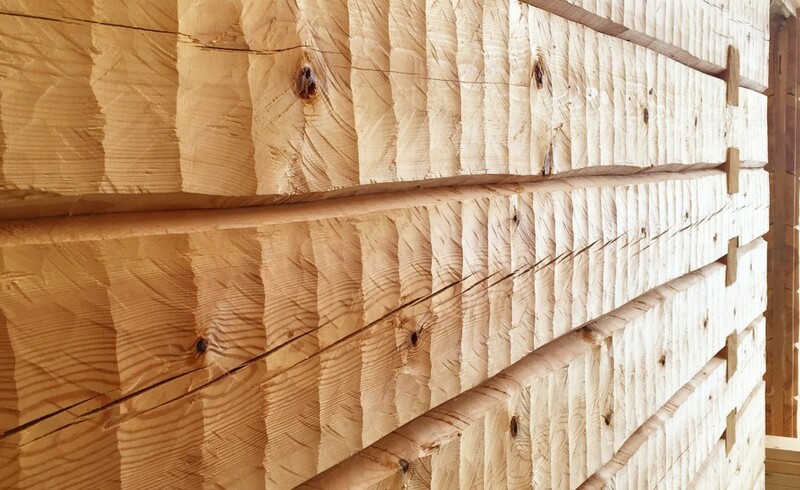 The compact 190 m2 building is built solely with natural materials with a sculptural pitched roof in zinc plate and a masterfully handcrafted wooden log structure, which is left visible and untreated. Furnished with wood-burning stoves it recreates the calm and almost sacred feeling of the traditional Finnish sauna, while placing it in a new, contemporary architectural frame. The skillful use of larch in the furnishings and the large windows opening on to the archipelago create strong contemporary interiors. The terrace is directly accessible from the sauna rooms and from the outdoor shower space bridging the sauna with the seashore. More information on the Lonna Sauna here. 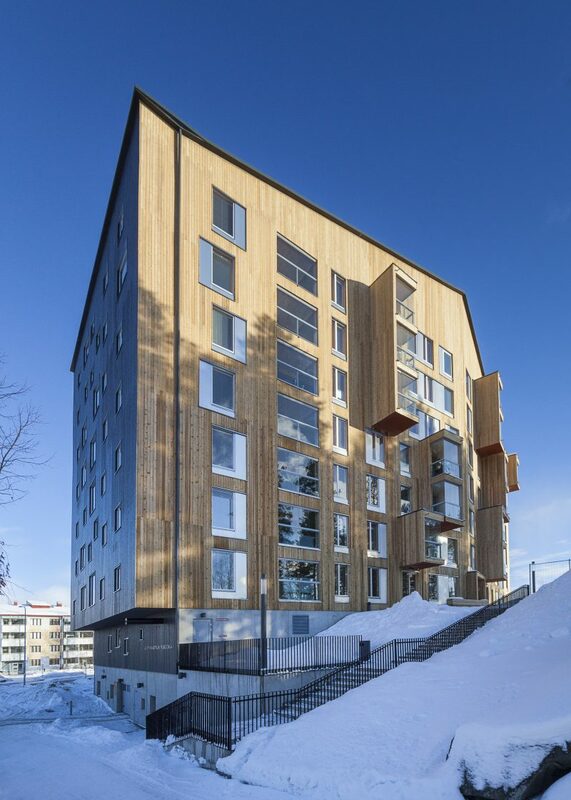 Completed in summer 2017, Pihapetäjä is the first wooden multi-story apartment building in Joensuu. It was commissioned by the Foundation for the Promotion of Karelian Culture as a response to their desire to build affordable rental housing of high quality in an ecologically responsible manner. The first tenants were welcomed to make their home in the building this summer and it has been well received by the residents. Pihapetäjä is the first of three multi-story wooden apartment buildings to be built in the block over time. The design is based on the modular principle that was first developed for the Puukuokka Housing Block in Jyväskylä. Here, it was modified to meet the specific requirements of the Pihapetäjä site and its apartment composition. The site at the edge of a pine forest provided a well-suited and attractive context for an apartment building to be built out of wood. The goal for the Pihapetäjä project was to build an apartment building of a human scale in Joensuu. Ecological sustainability and energy efficiency were central defining principles in the project. Pihapetäjä has a carbon footprint that is 40 % smaller during its life cycle than that of a regular apartment building. Solar panels produce energy for the general power grid and for the needs of the building itself. Thanks to the characteristic features of wood as a material, Pihapetäjä offers a great quality of life in a building that it feels good to breathe in. With several pilot projects in the city, Joensuu is today recognized as a pioneer in research and development in exploring the new potential of wood as a material for building and construction. As a readily available material locally, wood presents an important and viable alternative for the development of sustainable construction in the region. The Pihapetäjä building is part of a larger research and development project in the use of wood for building and construction today. More information on Pihapetäjä Housing here. Completed in summer 2017, Pihapetäjä is the first wooden multi-story apartment building in Joensuu. It was commissioned by the Foundation for the Promotion of Karelian Culture as a response to their desire to build affordable rental housing of high quality in an ecologically responsible manner. It has been well received by the residents and all of its units are now occupied. The first tenants were welcomed to make their home in the building this summer. Pihapetäjä is the first of three multi-story wooden apartment buildings to be built in the block over time. In response to an identified need in the area for studio apartments of relatively spacious character as well as for three room apartments with an efficiently arranged layout, Pihapetäjä is organized around these two apartment types. All units, including the smallest ones, have a retracting balcony. This has made it possible to create a glazed semi-public zone between the exterior and interior of the building. The retracting balconies also afford the apartments with generous views into the surrounding forest landscape. In the heart of the building there is a spacious hallway that gets wider towards both ends. The building services engineering is integrated in the walls between the apartment units and the hallway. The central hallway was finished on site while the apartment units were built with prefabricated volumetric modular elements prepared in a controlled factory environment. The studios are composed of one element each and the larger units of two elements each. With several pilot projects for stadiums, large hall spaces and for office buildings, Joensuu is today recognized as a pioneer in research and development in exploring the new potential of wood as a material for building and construction. 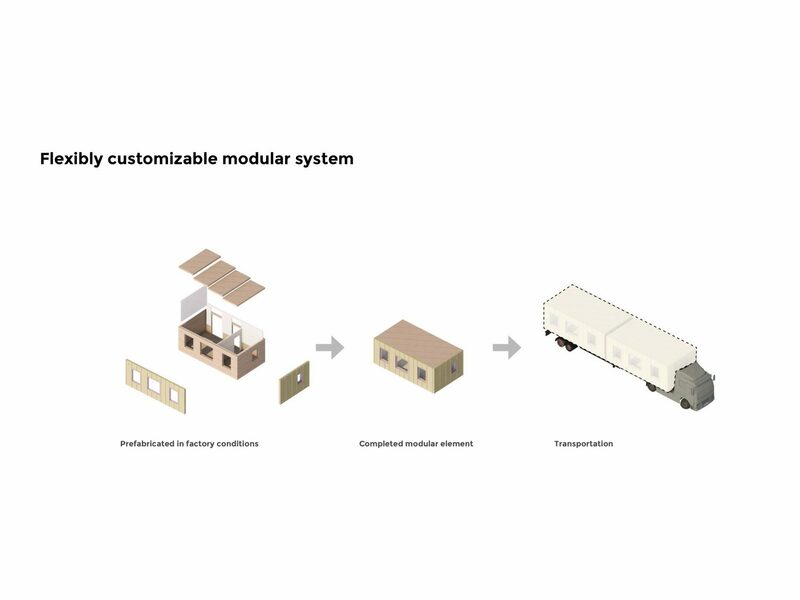 As a readily available material locally, wood presents an important and viable alternative for the development of sustainable construction in the region. The Pihapetäjä building is part of a larger research and development project in the use of wood for building and construction today. As part of the ongoing research project, information on the residents’ experience of living in the building will be collected over a ten-year period of time. Also technical data will be collected and monitored over time with the help of sensors installed in the building. This information will be used to assess the long-term effects of wood on the quality of life and of the performance of wood as a material in large-scale buildings over time. Alongside with the Foundation for the Promotion of Karelian Culture also the Karelia Institute and the University of Eastern Finland were partners in the development phase of the Pihapetäjä project. More information on Pihapetäjä on OOPEAA website here or on Puulehti here. Anssi Lassila will present a lecture at the Fay Jones School of Architecture in Fayetteville, Arkansas as part of the Fay Jones School of Architecture and Design lecture series. In his lecture, titled “Scale, Light and Material,” Lassila will present several works by his office, from his first project, the Kärsämäki Shingle Church, to some of the most recent ones, as a way of demonstrating how the aspects of scale, material and light serve as key elements of architecture in his work. The lecture is the Miller Boskus Lack Architects Lecture in Wood Design and Construction and the 2017 Dean’s Lecture in Nordic Architecture, in promotion of the Fulbright U.S. Scholar Program. 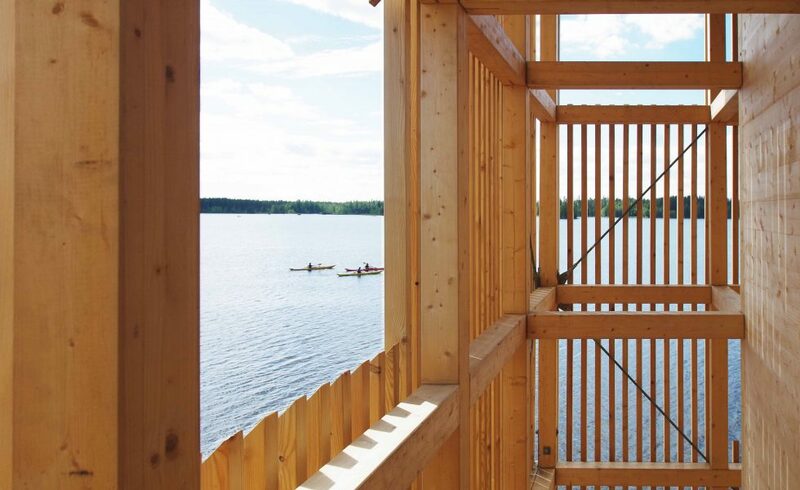 Drawing from his extensive experience in working with wood in architecture, Anssi Lassila discusses the material qualities of wood and the ways in which they find expression in defining the structural framework of a building. Special attention is given to exploring the potential of wood as a sustainable solution in architecture and construction. New techniques and new ways of handling wood as a material for building open up new possibilities in flexibly customized standardization today, for example through the use of a modular system of prefabricated volumetric elements of cross-laminated timber in creating multi-story wooden apartment buildings. However, the lessons that can be learned from the age-old tradition of working with wood continue to offer us a valuable source of information and inspiration in exploring new solutions. In his lecture, Anssi Lassila will also reflect on how the Nordic values and sensibilities get expressed in his architecture. The Fay Jones School of Architecture is pursuing continuing education credits for the lecture through the American Institute of Architects. The public is invited to attend. Admission is free, with limited seating. For more information, contact 479-575-4704 or fayjones.uark.edu. The ninth annual Spotlight Prize will be awarded to OOPEAA. Founder and Director Anssi Lassila will visit Houston on Wednesday, September 6, 2017 to accept the prize and give a lecture at The MATCH, Houston at 7 pm. Admission is free and open to the public. Spotlight: The Rice Design Alliance (RDA) Prize celebrates the work of emerging architects from the U.S. and elsewhere in the world. This award highlights the work of exceptionally gifted architects at an early stage in their professional careers. This year the Board of Directors of the Rice Design Alliance unanimously selected OOPEAA as the 2017 Spotlight Award recipient in full recognition of the outstanding and inspiring work of the office. In his lecture Anssi Lassila will share his thoughts on architecture and on the process of creating architecture. He will present a selection of the work of the office from its early years all the way to the present day as a way of illustrating how his thinking about architecture and the values behind the work of the office are reflected in their buildings. The Suvela Chapel has been chosen as the winner of the Accessibility Award of the Year 2017 awarded by the Espoo Disability Council. The Accessibility Award was established in 2014 and it has been awarded annually since then making this the fourth time it was given out. The award aims to recognize a service, company, community, realized idea, person, building or activity in the city of Espoo that has made a significant contribution to making services accessible to us all and to facilitating easy physical access to them. This year there were 14 nominations for the award. The Suvela Chapel was chosen the winner, and the Kino Tapiola, the Sello Shopping Center and the transportation service of the Espoo Disability Services received honorary mentions. The award was given out by Jukka Mäkelä, Mayor of Espoo in the Espoo Day celebration on August 25, 2017. 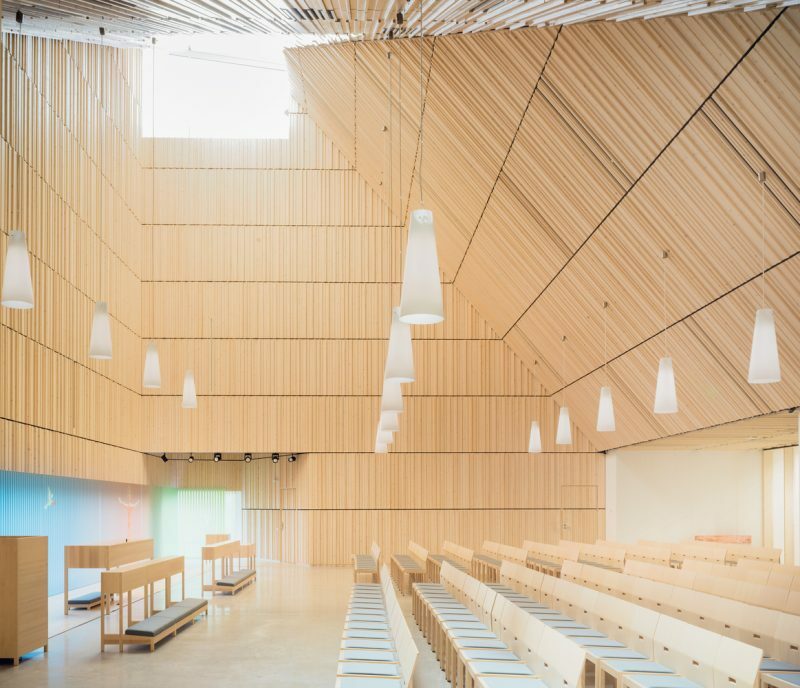 The Suvela Chapel by OOPEAA was commissioned by the Espoo parish union and it is used jointly by the Parish of Suvela, the Swedish Parish of Suvela, and the City of Espoo. It offers an easily approachable and accessible space with a human scale and an inviting atmosphere. It provides a home base for many different organizations forming a dynamic place of activity. It is a meeting place that serves the entire community. The chapel is centrally located in Suvela and it is easily accessible by public transportation. Accessibility has been carefully considered in the design and realization of the building. All functions and services are placed on one level and there is easy access from the chapel lobby to the spaces for the youth as well as to the spaces used by the community park and the kindergarten. The activities and services provided by the chapel also reflect a commitment to accessibility in the multicultural community. The staffis helpful and dedicated to creating an atmosphere that promotes accessibility and openness. The chapel with its the adjoining community park was inaugurated in September 2016 and it has been well received by the community. For information on the Accessibility Award in Finnish, see here. For more information on the Suvela Chapel, see here and here. 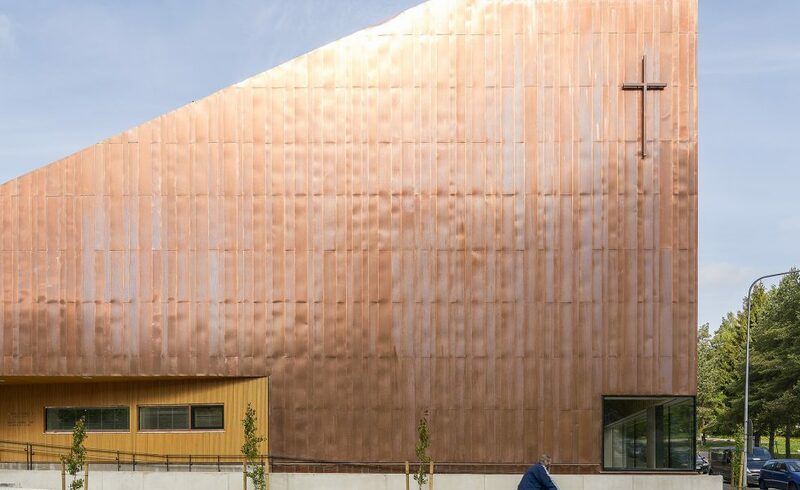 The shortlisted works for the European Copper in Architecture Awards have now been announced, and the Suvela Chapel by OOPEAA in Espoo, Finland is one of them. The Chapel is a multifunctional building that offers a space for the people of the community to use together for their many different needs regardless of their religious affiliation. OOPEAA embarked on the design and planning for the Suvela Chapel and the nearby community park in 2012 and the building was completed in 2016. The goal was to create a building that has a strong identity of its own while also entering in dialogue with the multicultural context of its suburban neighborhood. 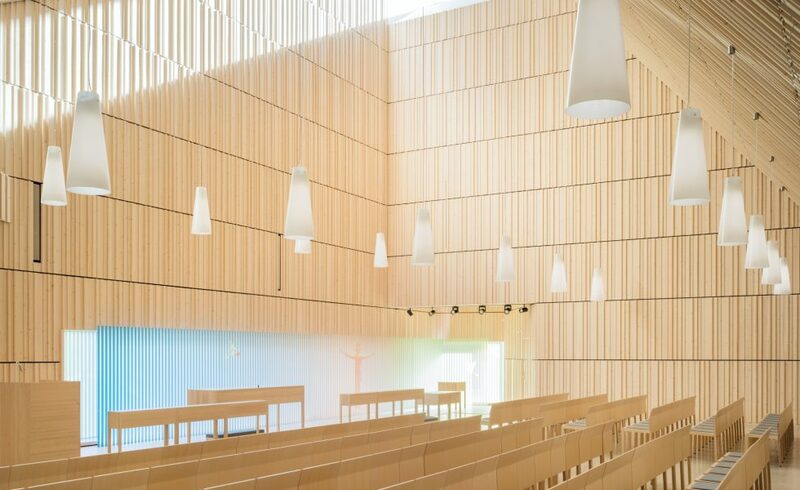 The Suvela chapel was commissioned by the Espoo Parish Union and it is used jointly by the Espoo Parish Union, the Swedish Parish of Espoo and the City of Espoo to serve the entire community of Suvela. The chapel offers an approachable and welcoming space with a human scale and an inviting atmosphere. The building serves many functions and provides a home base for many different kinds of organizations. Since it was inaugurated in September 2016, it has provided a dynamic place of activity for the inhabitants of all ages in the neighborhood. It is first and foremost a meeting place that serves members of the parish and other groups of people in the community alike. For more information on the Suvela Chapel, click here. European Copper in Architecture Awards is a biennial showcase celebrating architectural design of buildings that incorporate copper or copper alloy in cladding, roofing or other architectural elements. More information on the European Copper in Architecture Awards here. You can vote for your favorite among shortlisted buildings. The voting is open until 31 August. To vote for the Suvela Chapel, click here. The ninth annual Spotlight Prize will be awarded to OOPEAA. Founder and Director Anssi Lassila will visit Houston on Wednesday, September 6, 2017 to accept the prize and give a lecture at The MATCH, Houston, at 7 p.m. Admission is free and open to the public. Spotlight: The Rice Design Alliance (RDA) Prize celebrates the work of emerging architects from the U.S. and elsewhere in the world. This award highlights the work of exceptionally gifted architects at an early stage in their professional careers. The RDA Spotlight committee convenes annually to consider local, national, and international architects who demonstrate design excellence and promise a great design future. Since its inception the Spotlight Prize has been awarded to such architects as Sou Fujimoto (Japan), Anton Garcia Abril (Spain), Pezo von Ellrichshausen (Chile), and LA Dallman (U.S.A.) among others. Last year’s award recipient was the Barcelona and Mexico City office of Cadaval & Sola Morales. This year the Board of Directors of the Rice Design Alliance unanimously selected OOPEAA as the 2017 Spotlight Award recipient in full recognition of the outstanding and inspiring work of the office. 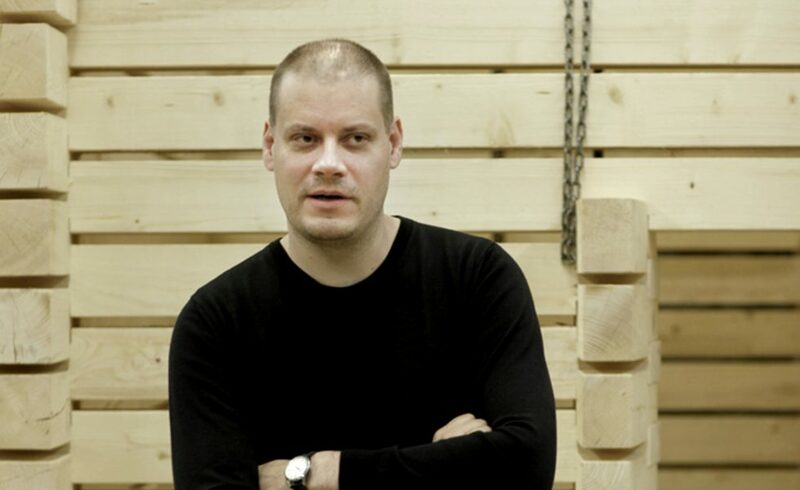 Anssi Lassila is the founder and principal of OOPEAA Office for Peripheral Architecture. 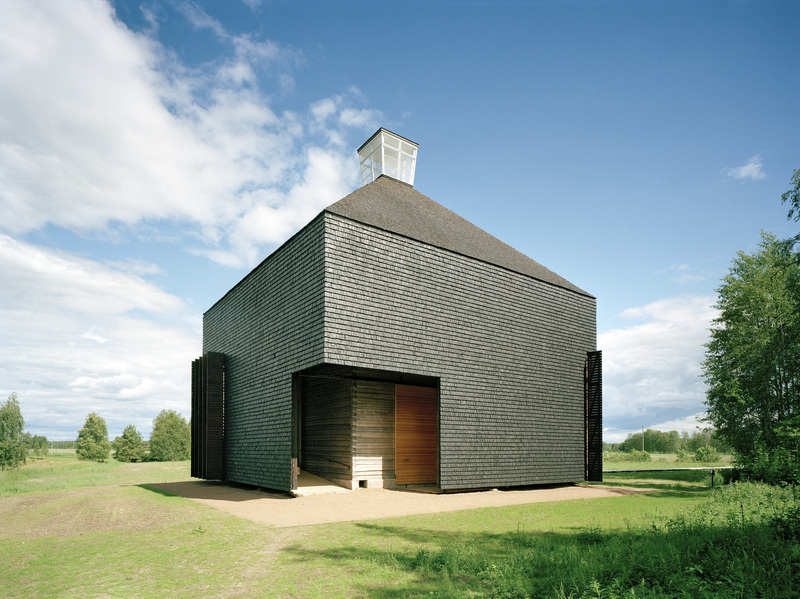 His international breakthrough was the Kärsämäki Shingle Church in 2004 after which he quickly gained a distinctive position among young Finnish architects. His architecture displays an interest in combining a sculptural form with traditional materials and innovative techniques. Lassila has extensive experience in working with wood in architecture. In his approach he emphasizes the potential embedded in exploring new methods and techniques as a means of developing new solutions in building. OOPEAA works on a wide range of projects on varying scales from churches and daycare centers to housing and town planning as well as extensions to historically valuable landmarks. The Rice Design Alliance is a non-profit organization formed within the Rice School of Architecture in 1972 and dedicated to the advancement of architecture, urban design, and the built environment in the Houston region through educational programs, the publication of its award-winning journal Cite: The Architecture + Design Review of Houston, and active programs to initiate physical improvements.